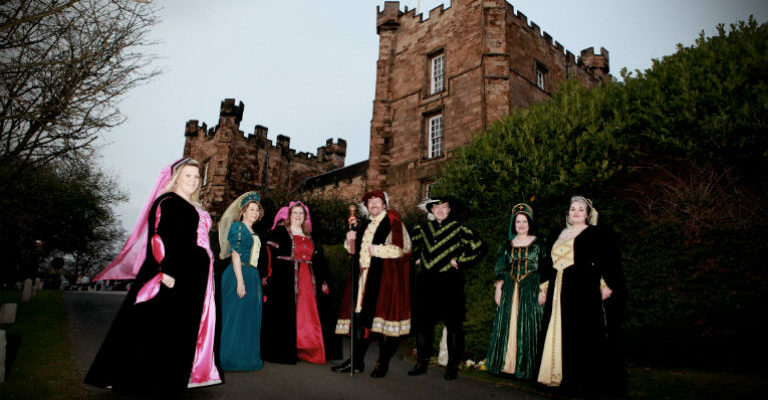 On Friday 13 and 27 April and 10, 11 and 26 May, four-star Lumley Castle Hotel, Chester-le-Street, is turning back the clock to 1595, with its famous banquets – giving diners and partygoers a fun-filled night, Elizabethan-style. On arrival at the castle guests are led to the dungeons before being piped into the opulent Baron’s Hall and seated on benches for dinner, which is served by Ladies of the Court and eaten with a dagger instead of cutlery. To accompany dishes, such as sticky pork ribs and honey-baked chicken, diners are served red wine and mead in earthenware goblets. Meanwhile, in between courses, the Castle’s Lord Chamberlain entertains diners with tales of yore and local legends – including the sorrowful story of Lily of Lumley who was thrown into the castle’s well by priests and whose ghost has been seen by countless visitors and staff over the years. Throughout the evening the Lords and Ladies of the Court, dressed in period costume, perform sketches and a variety of songs, from traditional North East folk ballads to a rousing finale of more popular tunes, with diners encouraged to join in when they can. Finally, guests can round off the evening by dancing to a disco in the dungeon with a special price package also available for those wishing to extend the evening with an overnight stay in one of Lumley’s 73 bedrooms. Along with its Elizabethan Banquets Lumley Castle Hotel hosts regular murder mystery dinners while its renowned Black Knight restaurant can cater for formal or buffet lunches and dinners and can also offer private dining.